BOULDER — Boulder city leaders recently approved an agreement that makes Boulder Housing Partners the master developer of an affordable-housing project called 30Pearl. That project will include 120 affordable one-, two- and three-bedroom apartments at the 4.6-acre site at the intersection of 30th and Pearl streets. 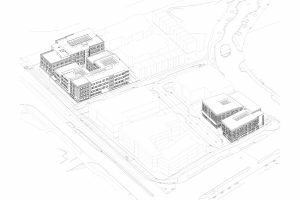 It will be part of the larger Boulder Junction, a 160-acre mixed-use redevelopment area. This rendering of the 30Pearl development shows the planned locations for affordable apartment buildings. Courtesy Boulder Housing Partners. BHP, the Boulder’s housing authority, will manage pre-development entitlements, infrastructure and construction, city documents show. BHP will own all the permanently affordable rental units, which will serve households earning 30 percent to 60 percent of the area median income. BHP will finance the project through sources such as private activity bonds, tax credits and grants. In addition to the 120 affordable rental units, plans for 30Pearl include 15 to 25 homes to be sold to middle-income buyers and as many as 134 market-rate homes.